unbelievable to read "arson" in the news stories. All my love to Oz. Madame, my thoughts go out to all Australians (even if one does not live in this area how can one not be touched) , so many lives lost and property destroyed - it is beyond comprehension. If, indeed, it is arson the people responsible need to be caught and severely punished - being put to clean up the aftermath comes to mind. It's too dreadful for words really--latest count on CBC says 141 dead, absolutely horrifying---and I lived in Victoria for 5 years (Melbourne) and spend many a happy day and weekend touring the countryside, staying with friends on farms-------I don't even want to know which towns have been destroyed, and the heat! and the drought! All too much, my heart bleeds. I was reduced to tears by the story of a woman hiding under a wet blanket while her husband and brother fought their way to her. It's just too much. I am so sorry for you all. Madame, I have been thinking and worrying about you and all the Southern Australia crew. We had a huge fire in Oakland in 1992 - 3,000 homes lost, but only 27 deaths. It was my neighborhood - and for years afterward it was just dreadful - all the color burned away - it looked like a black and white world. The houses are rebuilt and the trees and vegetation are mostly grown back now, but we still live in fear and we all sniff the air when the wind is blowing a certain way. So, my heart is there with you all and I'll keep the firefighters in my thoughts. Gingerpale nice to see you back. South Australia was really lucky this time, no fires here despite the fierce weather. The devastation in Victoria is appalling though, and difficult to comprehend. Here's a nice photo. 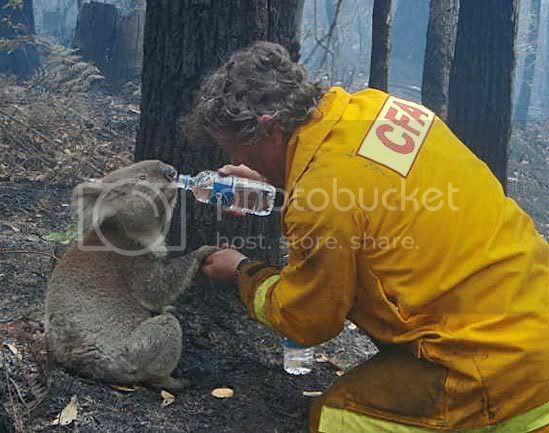 Apparently the koala drank 3 bottles of water, but the firefighter had to leave her there when he was called away to fight the fire. Fortunately, the wildlife rescue people picked her up and are tending her wounds. 3rd degree burns to her back feet, with 2nd degree to her front. I am a sucker for koalas, this picture is killing me. I was reading the news and feeling like I was reading fiction. Some dreadful sci-fi tale and then I read the probability of arson. Rudd is right to call it mass murder. The man who put his children in the car, turned to get the rest of his things and came back to find the car on fire. If it were enough to make one weep, I'd have cried enough tears to put out the flames. And the other species; the plants as well as the animals and insects, who have no choice but to die in something they don't understand. Such cruelty and such tragedy and such misery. What a species we are that some can delight in arson for their own venality. and so...the people connections continue..
these things might have been of import..
deep times methinks dear Griffin.. It amazes me that people can be so thoughtless. They tell you to not light fires , or make sure it's out. But it's the little things like tossing a cigarette out a moving car or a match . One little spark can cause so much pain and devastation.